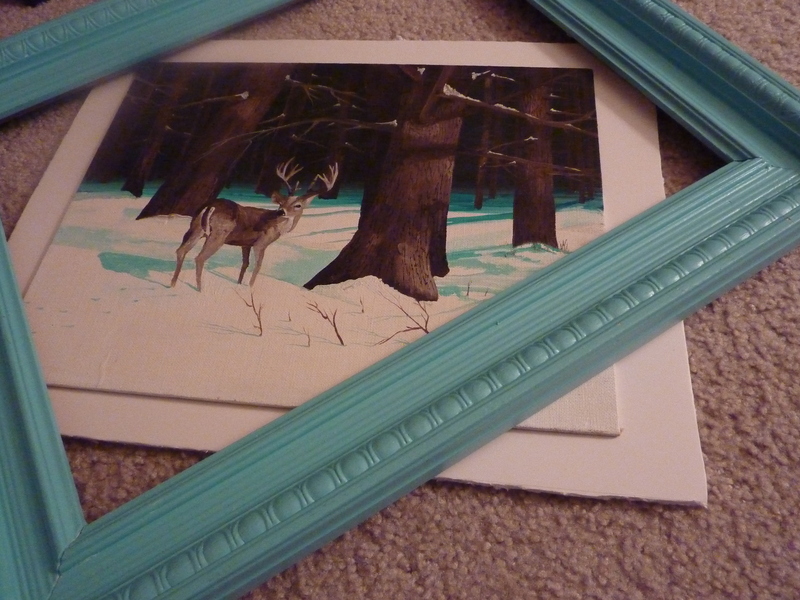 After seeing and leaving this deer painting at the thrift store, I couldn’t get it out of my head. I had to go back and rescue it from that place. A nice artist named Vicky painted this in ’78 (or perhaps she painted 78 of them? ), presumably to sell. There are a couple different prices at the bottom, but that stickered price at top was my price from the thrift store. Sold. I got it home and realized I had no idea what to do with it. 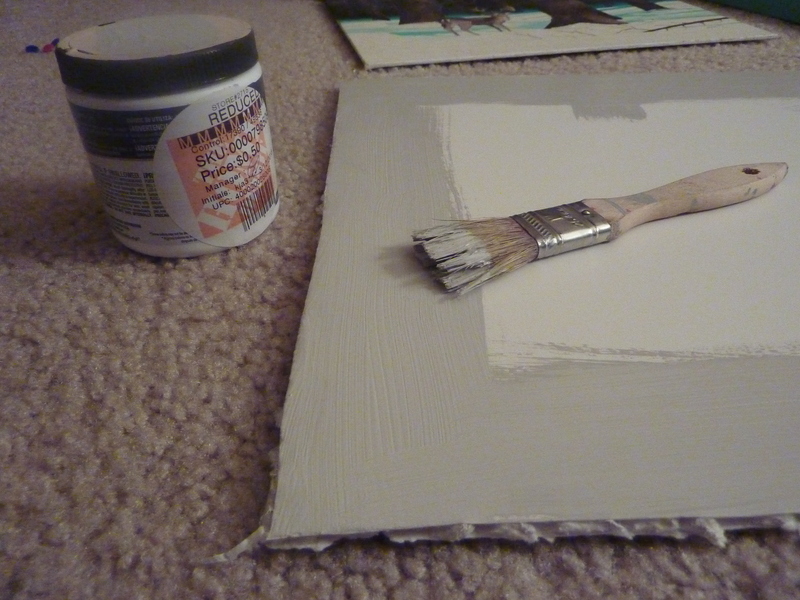 It’s a flat canvas, which means that it wouldn’t have a lot of dimension to it if I hung it up on it’s own. 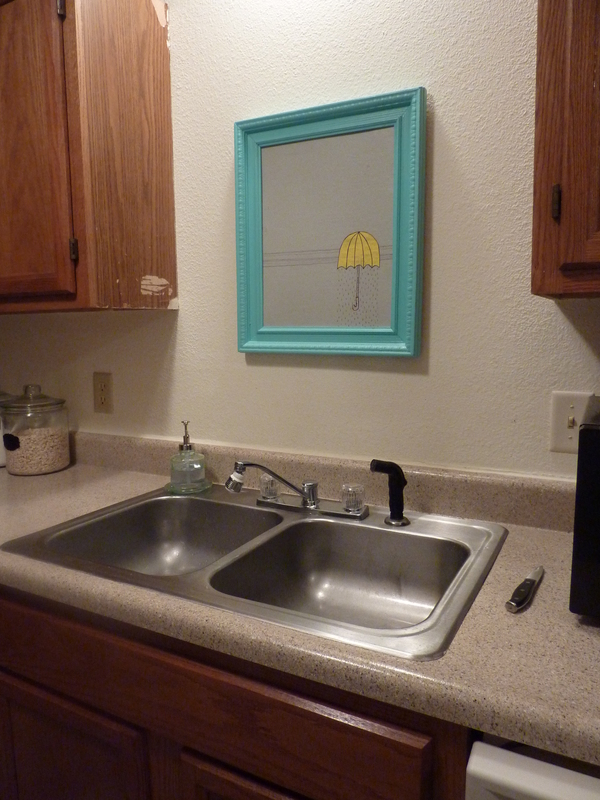 So this painting languished around the apt. for a few weeks before I had an “aha!” moment. Before I hung the seascape over our sink, this umbrella art hung there. But when the seascape took over, this framed artwork didn’t have a home. 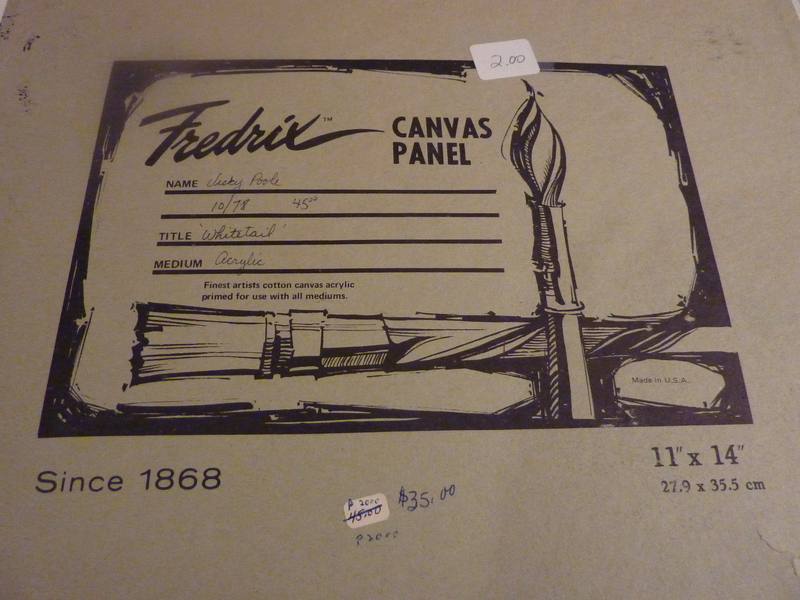 Great news: the dimensions of the frame were perfect for this 11″ x 14″ flat canvas. I cut out a piece of foam board to replace the umbrella artwork (since I still like it and don’t want to paint over it just yet) and I painted a gray faux mat upon which to mount the deer art. 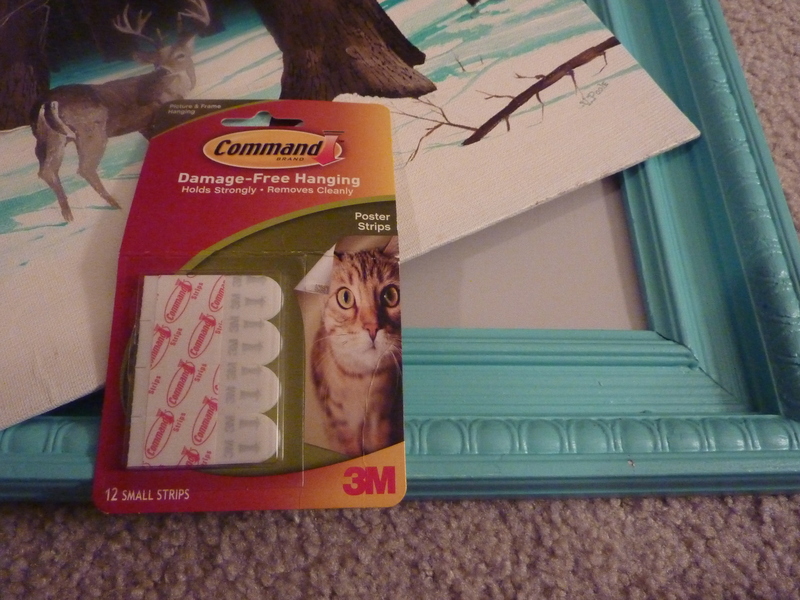 Then I used 3M command poster strips in each corner of the deer canvas and stuck it to the foam board mat. I hung it up in our small hallway. Previously hung here was a chunky chalkboard frame that is now homeless…much to my chagrin, we only have so much wall space…so now I’m redecorating places I’ve already decorated. 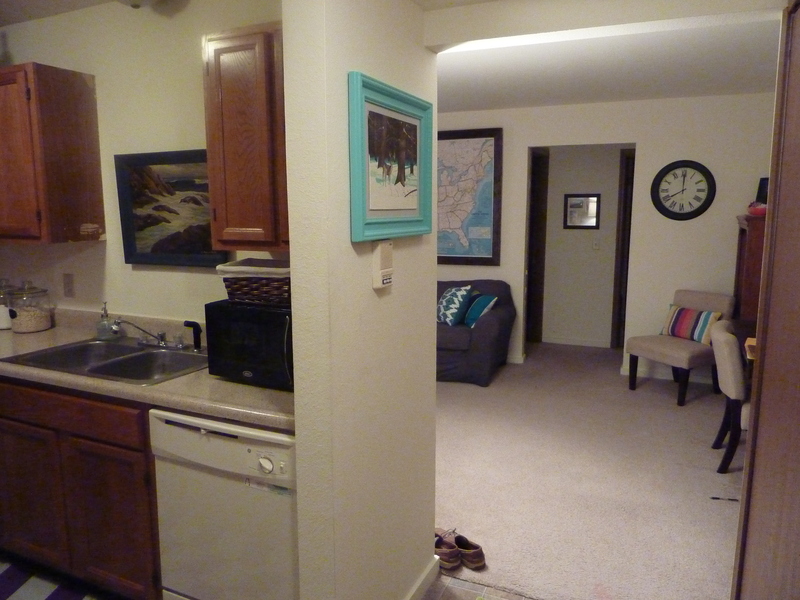 Here’s a better shot showing you the layout of our apartment. I was basically standing in our doorway when I took this picture. We have a lovely door speaker thing which meant I had to hang the deer a bit high, but I didn’t have a lot of options. Before I realized how well the frame matched the painting, I was sold on repainting the frame purple. But since the aqua/turquoise frame color matches the painting quite well, I decided to leave it for a bit before I rush into anything. On second thought, Ken might enjoy that, so don’t mention it to him, please. 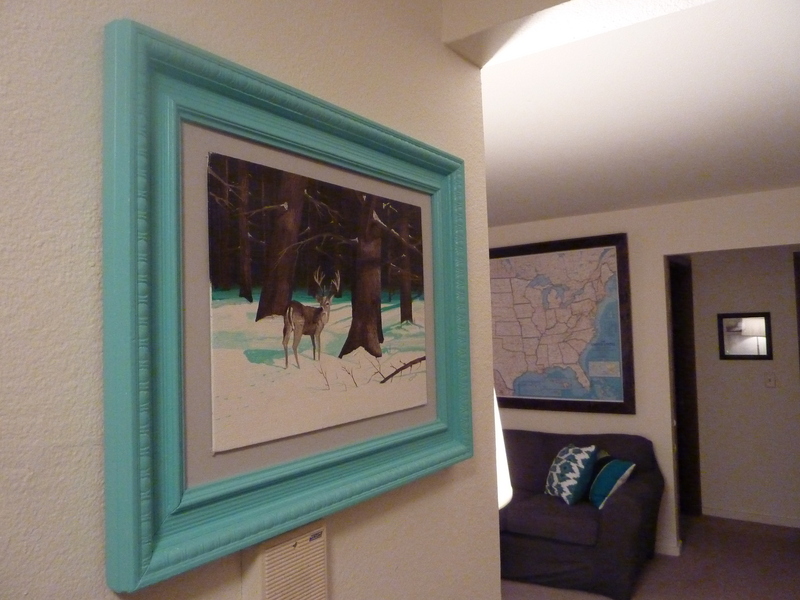 Categories: Home Decor | Tags: framing a flat canvas, white-tailed deer painting | Permalink. Please tell me your apartment isn’t always that clean. Wait, I’m missing the point. Back to the deer. I think the frame is glorious as it is; don’t repaint it. But maybe this is enough of the deer art. You will have to go totally forest if you get any more–giant lumber bed frames, leaves glued to the mirrors… But if anyone could make it work, you could! And you forgot taxidermy. But, no fear: I draw the line there. NO dead animals in my house! Love the frame color….pops the blue snow (?) in the artwork. Fun, fun, fun!